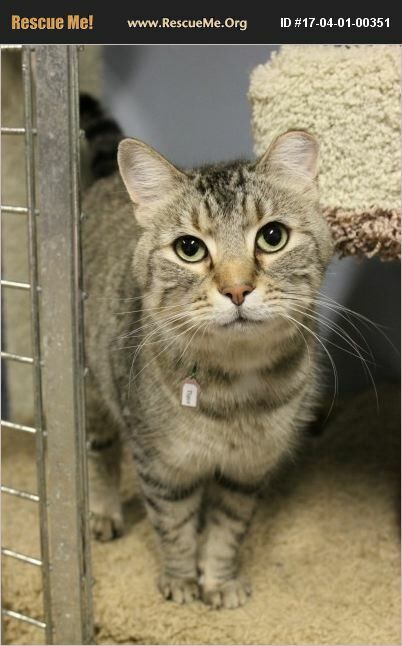 Tiger is a male, DSH gray Tabby; 6+ yrs. as of Mar. 2017 - DOB 7/18/11. Up-to-date on vaccinations; neutered; FELV/FIV (-). Tiger came to us from a private party who pulled him from the euth. list at another shelter. Tiger was initially found as a stray in someone's garden, nearly lifeless and in immediate need of medical care. Tiger was nursed back to health and then placed in a shelter for adoption - we're not sure why he ended up on the euth. list but we are grateful to the person who saw his potential and saved him. Tiger is a sweet boy but he needs a home where he can be with adults and older children who understand his signals - Tiger does not like being petted on his back quarters and will nip if over stimulated in that area. Do not let this deter you though - he is a very affectionate boy, he just doesn't like that type of petting. It's just a little quirk - not a big deal - he has plenty of wonderful traits that you'll find very charming; for instance, head pats and chin scratches - now those he loves! If you have a home that would suit our sweet boy and you think you'd be a good match for him, stop in during visiting hours and we'll introduce you. BEFORE CONTACTING US REGARDING TIGER, PLEASE REVIEW OUR ADOPTION POLICIES AND PROCEDURES.